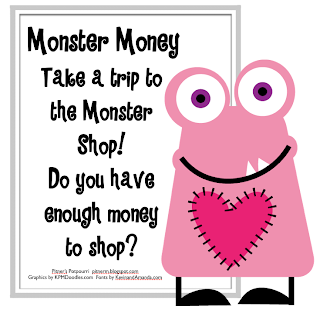 Let your kids shop in the Monster Shop to practice adding money and making change from $5.00. Click on the pic to download the game.....and leave a monster of a comment! loving the little monsters - thank you! I've got the money graphics in the works! Should be posted in my shop by tonight! Hopefully... It is my first day back to school today, so it might be kinda crazy! This is so cute! I downloaded it and I can't wait to use it with my kiddos! I am planning on tackling money this week so this is perfect! So cute! Thank you for sharing it! Thanks so much! This will be a perfect game for my kiddos that didn't quite master money yet. Thanks, all! I have a few more money activities that I'll post later this week, so keep checking back. So fun and cute. I can't wait to use all of your money games at home with my children. Thanks for all the money games. They will be great practice for my third graders.